On Thursday, October 8, 2009, the place to be and be seen in the District is at Flashpoint, for the most unusual opening reception from 6-8pm of Andrew Wodzianski's House. Let me start with a warning: prepare yourself for an art exhibition like no art exhibition that you’ve ever been to, in fact, an art exhibition like no one has ever been to. Not that novel ideas for art exhibitions are anything new for Andrew Wodzianski, but this one takes the prize. Years before Twitter, Wodzianski orchestrated a solo show at Fraser Gallery where visitors could use Yellow Arrows (Twitter’s predecessor) to text immediate criticism and comments about his work to an online site. It was such a new and innovative marriage of art and emerging digital communications technology, that most of it completely went over the heads of art critics and visitors alike: “text what to where?” It did catch the attention of a University curator who gave Wodzianski a follow up exhibition of this novel pre-Twitter concept of immediate digital feedback. He also once showed up to an opening dressed as a ninja, and once as a woman. In this exhibit you will see thirteen artworks (not a coincidence), nine of which will be paintings. All nine paintings depict interior sets and props used in William Castle’s cult campy film 'House on Haunted Hill’, which celebrates its 50th anniversary this year. 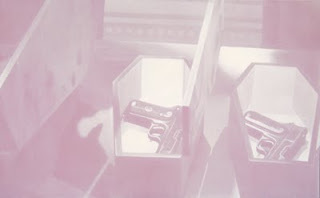 The paintings are a triumph of technical and creative visual minimalism as still images from the film are manipulated and juxtaposed onto tinted canvas, and obfuscated by multiple layers of white glaze and velaturas [literally, there is only white titanium oil paint on a pastel ground]. Much like the 1959 film, the paintings themselves appear veiled and slightly threatening and unresolved. But there’s a lot of other stuff going on around this exhibition besides these uneasy images. There is a real casket, a haunted house, Andrew’s first “official” art performance, selective mailings, miniature coffins, a scavenger hunt, free artwork, nurses, funeral directors, pall bearers, Twitter feeds, a Halloween after-party, and O yeah… be prepared to meet Vincent Price (star of the film). And most of all be prepared for an art experience like you’ve never experienced before. Lots of great art festivals coming to the area this month, starting this Saturday with one of the area's beat art and craft festivals: Alexandria's Art on the Avenue in Del Ray. Music, food, kids' activities and loads of good, affordable artwork. Marie Reed Learning Center on 18th NW St, NW at Wyoming. Bethesda Place Plaza, corner of Old Georgetown Road and Woodmont Avenue. Wanna sell some artwork in NYC this weekend? Then the Autumn Art Bazaar at Lyons Wier Gallery, NYC may be for you! On the heels of the success of the summer ART BAZAAR, Lyons Wier Gallery is pleased to announce its Autumn Art Bazaar being held this weekend, Saturday & Sunday, October 3rd & 4th. The ART BAZAAR is an OPEN CALL opportunity for any artist not represented by Lyons Wier Gallery to display and sell their work in the gallery, located on the NE corner of 20th Street and 7th Avenue. There is no price structure, no visual filter for inclusion and no politics for entrance other than a willingness to show up, step-up and sell their work. The ART BAZAAR strives to be a grass roots venue that is a catalyst for collecting art. The ART BAZAAR offers a unique opportunity for unrepresented artists living in New York to establish a presence in the art community. It allows for an open dialogue between the artist and collector and is unabashedly about the transaction between artistic creativity and financial sustainability. Due to its spontaneous nature, there is no telling who or what will be represented. This summer, participants varied from the seasoned professional to the absolute novice, prices ranged from $50 - $4500, and every possible medium was shown. The ART BAZAAR continues to utilize social networks like Facebook, eBlogger, Twitter, uTube, Tumblr. and uStream.tv and is streamed LIVE on www.ArtBazaar.tv. The ART BAZAAR opens to the public Saturday 11-7 & Sunday 12-7. The Smithsonian American Art Museum is organizing the first major exhibition to explore the connections between Norman Rockwell’s iconic images of American life and the movies. Two of America’s best-known modern filmmakers — George Lucas and Steven Spielberg — recognized a kindred spirit in Rockwell and formed in-depth collections of his work. “Telling Stories: Norman Rockwell from the Collections of George Lucas and Steven Spielberg” will be on view in Washington, D.C., from July 2, 2010, through Jan. 2, 2011. The museum is the only venue for the exhibition. Rockwell was a masterful storyteller who could distill a narrative into a single moment, and his pictures tell stories about the adventure of growing up, of individuals rising up in the face of adversity, the glamour of Hollywood and the importance of tolerance in American life. His images contain rich character development, subtle scenic contexts and implied narratives that resemble movie-making strategies. The exhibition will showcase more than 50 major Rockwell paintings and drawings from these private collections that are rarely seen by the public. Excerpts from interviews in which Lucas and Spielberg talk about Rockwell and the works in their collections will be shown in the exhibition galleries. Booz Allen Hamilton, a global strategy and technology consulting firm, is supporting the exhibition. Now for some easy predictions: the high brow elitist critics will all unite in one front and all hate this show. The public, being far more progressive and democratic in their acceptance of what is art (without silly obsolete notions of "high" art and all other art, and without ingrained notions of "illustration" versus "high art") will line out to see the exhibition and continue to love Rockwell as they have for decades. I'm with the general public. Tonight I will be at the Phillips after 5 event in DC's Phillips Collection, where three local art bloggers have been invited to share their perspectives about some of their favorite works in the museum’s permanent collection on October 1st, and I will be discussing the work of one of my former professors at the University of Washington, Jacob Lawrence. 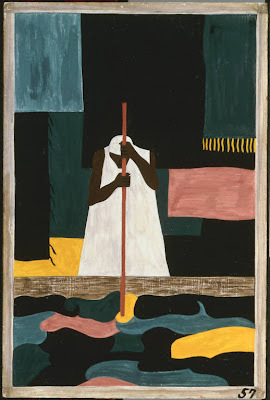 Jacob Lawrence, The Migration Series, Panel no. 57: The female workers were the last to arrive north., 1940 -- 1941, Casein tempera on hardboard; 18 x 12 in. ; 45.72 x 30.48 cm.. Acquired 1942. Julia Beizer, Washington Post’s Going Out Guide. Phillips after 5 is a "lively mix of art and entertainment on the first Thursday of the month. Other October highlights include a screening of selections from the Washington Project for the Arts annual Experimental Media Series." WHEN: Thu., Oct. 1, 5–8:30 p.m.